Studies show the actual cost to replace an employee is significant. Depending on a variety of factors—including skill level, education, and experience—the total cost of turnover can be as high as 150% of an employee’s annual salary. So, if you assume the average salary in your company is $50,000, then every time an employee leaves, the cost to replace them could be as high as $75,000. Now, multiply that number by your average yearly turnover, and you can see how quickly it adds up. 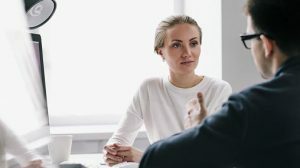 Basically, a stay interview is a great way to “check in” with your employees to ensure both they and the company are receiving what they need and want from the work relationship and to address issues before they get out of control. Identifying the parts of their job that bring your employee joy or what type of work interests them most not only helps you gauge job satisfaction but also how you can help them develop their career to capitalize on those interests. Just as important as identifying the parts of the job your employees enjoy is taking note of the things they could do without. Obviously, every position comes with its own form of “grunt work” that’s just part of the job, but understanding where an employee’s priorities lie, again, can help you build a plan for how they develop within the company. As your manager, what can I do to make our working relationship more productive? No two workers are alike and a management style that works for one may not be as effective for another. One of the top reasons people leave a job is a poor relationship with their boss, so it’s important to understand how your employees want and/or need to be managed. What would another company offer that would entice you to leave? Even if an employee enjoys the work they do, in today’s competitive labor market there is no shortage of temptation from other companies that may cause them to jump ship. From more generous benefit structures to perks like flexible scheduling or opportunities to work from home, the competition is doing everything it can to lure the best workers their market has to offer. How can I better support your career goals? In the end, showing genuine interest in how your employees’ careers develop is one of the most important ways to build a workforce of talented people who, in turn, genuinely care about the success of the company. Do you perform stay interviews with your employees? What are some of the questions you like to ask? Let us know in the comments section below. This would have been a difficult conversation with my last manager. Could I have been honest about her abusive and negative behavior, undermining me with my team at every opportunity. Would she have cared that I was unhappy? She sure was upset when I told her I was taking a different position and tried to use scare tactics to get me to stay. I’m glad to be rid of her. I am so much happier with a supportive boss who values team work and respects me. That is definitely a difficult situation. Stay Interviews only work if both parties involved are committed to the process. We’re glad you found a better work situation! Thanks for the comment! Never thought about doing stay interviews. This is great information that I will definitely use. Thanks! This is a great concept and I plan to forward this on to my Director and General Manager. I can’t wait to implement. This will work well with IDP’s (Individual Development Plans) for our high potentials! I do ask some of these questions during performance reviews, depending on the employee and my sense of their commitment to their job but I will start incorporating those that I haven’t used and may consider doing “stay” interviews. We have very little turnover at my company as we are relatively small, pretty close knit and as a company we offer a very competitive benefits package, virtually unheard of for a company of our size in this city. It’s a job seeker’s market right now, so a company with great benefits definitely has the upper hand in recruiting and retaining top talent! Thanks for the comment! Great idea. How often should these take place? Quarterly? We are trying to be more consistent in checking in with our associates. We have the standing one year review but want to start having check ins more often. Seems like the stay interviews might fit the bill. It really depends on the company and their relationship with their employees. If you do an annual review, maybe the “stay interview” could serve as a mid-year check-in six months before the performance review. Thanks for your comment! How can we utilize your skills to help others in this organization step up in their leadership skills? short articles like this are very helpful. Open communication and appreciation is the key to keeping the high performers. That’s a great question! Building an environment that encourages ongoing development is crucial. Especially in a tight labor market like we’re seeing now. Love the concept! Important to have the open communication and rapport with your team to get the honest feedback.